Dr. Ghada Hijjawi-Qaddumi ‘76 is a remarkable person whose exceptional academic and career achievements are an inspiration to many young people. She is an independent scholar with an interdisciplinary academic background. 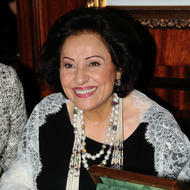 She is the first Arab woman to be elected President of the World Crafts Counsil-Asia Pacific Region, a member of the Society of History and Archaeology (GCC), a member of the Board of Trustees of Hani Qaddumi Foundation (Jordan), a member in MESA (USA) and a member in HIA (USA). Dr. Qaddumi is also the recipient of the Gulf Cooperation Council Award for Achievements in the field of Antiquities.